Arunachal Pradesh PSC Recruitment 2018: The Candidates who are waiting for Public Service Commission Recruitment can apply now! 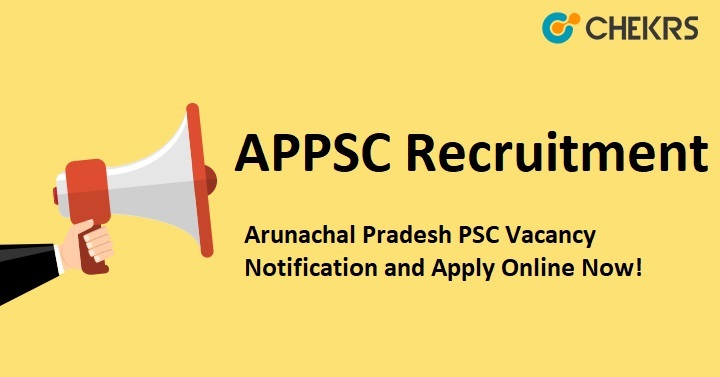 The Arunachal Pradesh Public Service Commission (APPSC) has been released the 19 vacancies for Assistant Professor Posts. In our site, we are providing all details about the APPSC Assistant Professor Recruitment 2018 and given information about Exam date, exam notification, application date, the method of an apply application form, Pay scale, selection process, age limit etc. for Assistant Professor. Important Details of the Arunachal Pradesh PSC Recruitment 2018 are given in the below table. Applicants who fulfill the eligibility Criteria of Arunachal Pradesh PSC Recruitment 2018 must apply for the application form. You can check details of Arunachal Pradesh PSC Recruitment 2018 below. Search the Application form section and click on Assistant Professor- Govt. Law College Link. A new window will be open and Download the Application form. Along with the duly filled up Application form and Attendance sheet, candidates must enclose the Self Attested copies of certificates, Marks sheets and Other Documents. Enclose original copy of DDIIPO of Rs. 100/- for APST candidates and Rs. 150/- others. Remarks: To receive more updates on Latest Arunachal Pradesh PSC Recruitment 2018, keep visiting our site www.jobs.chekrs.com. We can provide all information in future related to PSC recruitment. In the case of any query or review, you can place your valuable comments in the commenting section below. Thanks, for you, visited our site.